Was Noah’s flood caused by the sudden emptying of a huge glacial lake in Canada, which led to a catastrophic rise in sea level? This was suggested in a 2007 press release from the University of Exeter here in England, quoting one of the university’s professors, with the title ‘Noah’s flood’ kick-started European farming. The same material was also published by ScienceDaily, but with a question mark added to the title. This press release is about a proper scientific paper published in a respected journal. It must be rare for such papers to mention biblical stories. No creationist pseudo-science is in sight. I came across this paper while researching for a discussion on Facebook about my recent post Instone-Brewer: Did Noah’s Ark actually happen? One of my friends in that discussion suggested that a flood caused by rivers would not last as long as the biblical flood is said to have lasted. In response I looked into the possibility that the flood could have been caused by a sudden rise in sea level – and found that the Exeter scientists had got there before me. 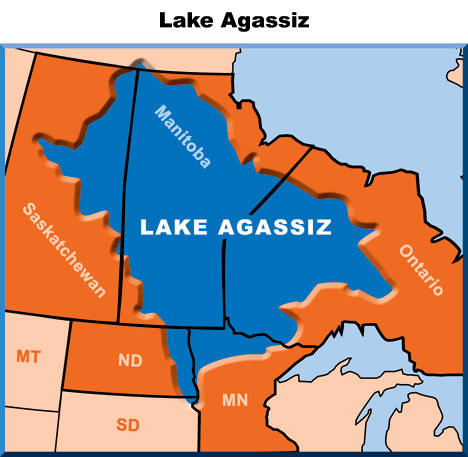 The culprit, apparently, was Lake Agassiz, a huge prehistoric body of fresh water which covered a large part of what is now Canada and a smaller part of the northern USA, centred in what is now Manitoba. This lake, according to Wikipedia, “held more water than contained by all lakes in the world today”. Its waters were dammed up by the Arctic ice sheet. As that ice sheet gradually melted at the end of the last major ice age, on at least two occasions the water from Lake Agassiz escaped rather suddenly into the oceans. The first event, around 11,000 BC, is thought to have triggered off a thousand year mini-ice age called the Younger Dryas. Presumably this freeze caused the lake to form again. But renewed warming caused the water from Lake Agassiz and from the linked Lake Ojibway to the east to escape again around 6,400 BC. Again this led to a cold period, but not as long or severe as the Younger Dryas. Since then, it seems, the large glacial lakes have never formed again, although some remnants remain as modern lakes. The important point concerning Noah’s flood is the rather obvious one that the release of all that water into the oceans caused a significant rise in sea levels worldwide – and one which has never been reversed. Estimates of what Wikipedia calls a “near-instantaneous rise” range up to 4 metres, although the Exeter paper gives a more conservative figure of 1.4 metres. This rise in sea level would not of course have covered “all the high mountains under the entire heavens”, as recorded in Genesis 7:19 taken literally. But it may have caused especially catastrophic flooding in the Black Sea region. The Exeter paper links this with Noah’s flood. But I would look elsewhere, as David Instone-Brewer does, to low-lying Mesopotamia. What would the effect of the sea level rise have been there? Now “near-instantaneous rise” should not be taken as implying something like a tsunami. Probably the sea did not spill on to the land in the way seen in recent videos from Japan. But once Lake Agassiz started to break through the ice it could quickly have carved out a very wide channel, and so need not have taken many years to drain. Scientific papers mentioning a period of 200 years are probably only giving a maximum time. There is no reason to doubt the biblical account that the waters rose for forty days (Genesis 7:17), although this is probably to be understood as a round number rather than a precise figure. The account in Genesis also mentions both that “all the springs of the great deep burst forth” (7:11), a good poetic fit for the bursting of a glacial lake, and that there were forty days of rain (7:12), perhaps caused by the initial disturbance of weather patterns by the rush of fresh water into the oceans – although the following cold spell was generally also dry. Thus floodwaters flowing down the rivers into Mesopotamia would have met sea water flowing up them. No doubt channels would have become blocked with sand and silt, and a huge low-lying area would have been flooded with nowhere for the water to drain away. The recent Mississippi floods give an idea of how this event might have looked, but there would have been no artificial levees to contain the flooding and no floodways to channel it into the sea. Indeed probably quite a lot of land was permanently lost to the Persian Gulf. But further upstream the floods eventually retreated, but only after 150 days (7:24). So, I would continue to argue as I did in my previous post, the biblical account if understood as intended, and not as a detailed record of events, tells a realistic story of a huge regional flood which could have happened, which indeed scientists also tell us actually did happen. There is no scientific record of the actual ark, but then one would not expect that. But science agrees with the Bible story in saying that a flood did happen – and adds some interesting details such as that it had its origin in Canada. This entry was posted in Bible Studies, Evolution and Creation by Peter Kirk. Bookmark the permalink. Well, Tim, they say the Hebrew word often translated “islands” or “coastlands” refers to all the lands bordering the Atlantic, which would include at least eastern Canada as well as us in England.